Home > Blog > History Blog > A Closer Look: Lunch is On! The lunch counter-diner offered passengers a "casual, relaxed setting." Updating the existing fleet of passenger cars and locomotives was one of Amtrak’s biggest challenges as it assumed responsibility for the country’s intercity passenger rail system. In preparation for the start of operations in May 1971, Amtrak handpicked approximately 1,200 cars from a total pool of 3,000 held by the two dozen private railroads that had been relieved of their passenger service obligations. Almost 90 percent of the cars were either constructed of, or sheathed in, stainless steel, which meant lower maintenance costs. Mechanical and electrical overhauls were needed on roughly a third of the fleet, as were interior renovations. This image from the archives is one of many taken in Amtrak’s early years to show the interiors and exteriors of refreshed rolling stock and locomotives. Some images were distributed to media outlets as file photos for use in Amtrak-related stories while others appeared in advertising materials describing the nation’s new passenger rail system. 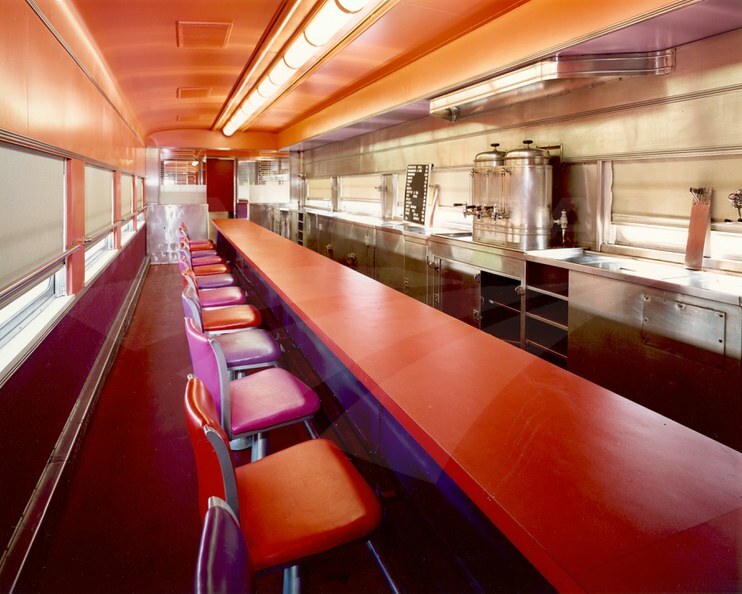 Delivered to the Santa Fe Railway by Pullman Standard in 1950, the lunch counter-diner car was originally numbered 1576. It was used on various trains including the popular El Capitan, an all-coach service between Chicago and Los Angeles. As manufactured, the car featured a 13 seat lunch counter, 20 seat diner, pantry and kitchen. In 1954 the diner area was reduced to eight seats (seen through the glass partitions at the back of the photo) to create space for a crew dormitory. Amtrak renovated and renumbered the car in 1973, and it continued in active service until retired four years later. The most expensive item was a sandwich for $1.20. Amtrak eventually sold the car, and it later ended up in Bakersfield, Calif., redesigned to accommodate a small café. Although the prices have changed with the passage of time, Amtrak café cars still offer a variety of light meals, snacks and beverages. Health conscious travelers can choose from options including fresh fruit cups, hummus with pretzels and fruit and nut mixes. Counter seating has also disappeared in favor of spacious community tables where you can get to know fellow passengers. Did you ever ride in one of the Amtrak lunch counter-diner/dorm cars? Share your memories with us below.